Sir Dave Brailsford tells a story about what happened to the British track cycling team after they blitzed the world at the Beijing Olympics. Track cycling does not really do privacy - the teams are separated in the middle of the track by dressed-up crowd control barriers - so Sir Chris Hoy and co were used to being watched; it was the sight of New Zealand's performance analysts filming their performance analysts that warned them this was a whole new level of scrutiny. 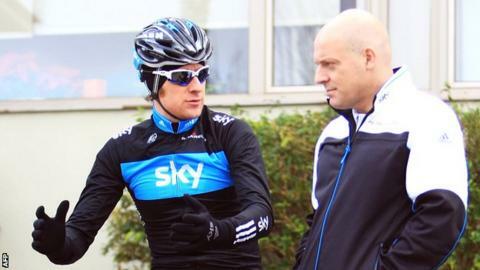 It is the position Brailsford and Sir Bradley Wiggins find themselves in at Team Sky. Your rivals get curious when you smash them to pieces at the Tour de France, win seven other stage races and top the season-long rankings by more points than a third of them accrue all year. Sky's Kiwi camera moment came when they saw team coaches belonging to three of their rivals outside a hotel down the road from theirs in Majorca. It was like that all December and January, apparently, the difference being that while the other teams came and went, Team Sky stayed, as they have done for the last three years. Block-booking a four-star hotel is an expensive business - possibly beyond the budgets of some of Team Sky's rivals - but it is one example of Brailsford's "no compromise" philosophy. There are lots more, though, and he and his senior coaches shared some of them in Port d'Alcudia last month. It was fascinating stuff, not least for its ambition. What follows is an attempt to unravel 26 pages of notes, or, to give it a snappier intro, Team Sky's plan to become "the most admired sports team in the world". Cycling, to paraphrase legendary Liverpool manager Bill Shankly, is a simple sport made complicated by idiots. Team Sky's head of "performance support" Tim Kerrison is not an idiot. Dave Brailsford: "Tim's genius is his ability to take something quite complicated and present it in a simple way, it has been a massive step forward for us"
The rider who generates the most power, for the longest duration, whilst weighing as little as possible, and slipping efficiently through the air, usually wins the race. All of these things can be turned into data. Kerrison is the man who makes sense of it. Every turn of the pedal a Team Sky rider makes is recorded by a power meter, analysed using performance software and then benchmarked against Kerrison's "power curve" models. Last year, for example, Wiggins's training was assessed against a template for a Tour/Olympic double. The gaps between these two lines on a graph - where Wiggins was and where he needed to be - were where Team Sky directed what Kerrison describes as "coaching interventions". Measuring power and using it as a training tool is not unique to Team Sky - and neither is it new. But what sets them apart is their total faith in it. The cycling calendar, like the golf and tennis tours, is a long slog punctuated by a handful of major events. As a member of the International Cycling Union's WorldTour, Team Sky compete in 29 races between January and October, as well as smaller events they pick as preparation for a specific target, or to satisfy sponsors. This is why WorldTour teams have 27 riders. But even with squads that large, most teams race all season, go on holiday in the autumn and then start training again in the winter. There is not much room for coaching. Not at Team Sky, though. Their top riders race fewer days than their rivals and they structure their seasons to accommodate mid-season "training blocks". For Wiggins, Chris Froome, the rest of the Grand Tour group and even the 10 riders targeting the Cobbled Classics in the spring, that means time off to train at altitude on Tenerife's Mount Teide. There is another element to the "less is more" approach to competition: Team Sky race to win, every time they sign on. One of recurring themes in the build-up to last year's Tour was that Wiggins had peaked too soon. He must have, argued the traditionalists, because he had already won three week-long stage races that season. But that was the plan. Racing was training, and controlling those races from the start conditioned the team to defending a lead and dealing with the media. Come July, it was second nature. As with football, you can usually tell which cycling teams will be successful by looking at their budgets. Wiggins: "Yes, we go to a volcano in Tenerife, but we don't go there to dope, we go to graft"
All teams have costs they cannot avoid - hotels, petrol and so on - but given the correlation between wages and winning, most keep their "operational spend" down to a minimum, typically allocating 90% of their resources to salaries. It is the cycling equivalent of putting the best possible XI on the pitch at the expense of everything else. At Team Sky, however, that split is 80/20, with greater investment in non-riding staff, research and training camps. "You'll get more from a £900,000 rider with a coach than you would from a £1m rider without one," is Brailsford's rationale. This is probably true - and may explain why some riders have ignored bigger offers from other teams - but it must also be stated that Team Sky's pie is bigger than most, however they choose to slice it. They might not be the Chelsea of the professional peloton, but they are Champions League. The last set of public accounts for Team Sky are from 2011. They show a budget of £16.7m (up from £14.6m in 2010), of which £11m went on wages. That figure alone is bigger than the total budgets of most of their rivals, which is why Team Sky can keep two superstars on the books - it was three last year with Mark Cavendish - and still be able to surround them with riders who might lead other teams and have money for fortnights at the top of a volcano. There are 18 nationalities on Team Sky's staff, speaking 11 languages, and there is a new location for at least some of the team every day. Last year's total was 400, covering racing and training days across more than 20 countries. With a schedule like that it can be very easy to get lost. Team Sky - surprise, surprise - have an answer. "We've got good at conference calls," said Brailsford, adding these are not just any conference calls. These are mandatory Monday morning conference calls, with standardised minutes. But as good as these virtual meetings are, you cannot beat an old-fashioned, face-to-face chinwag, which is why one of this year's innovations will be the establishment of a permanent performance base in Nice, staffed by Kerrison and Shaun Stephens, until recently the head coach of the Australian triathlon team. Coming from British track cycling, a team that is the textbook example of how centralised training models work, Brailsford was always going to be tempted to recreate a similar set-up at Team Sky - and nothing he has seen over the last three years has persuaded him it cannot work for road cycling. The team, which is still formally based at the National Cycling Centre in Manchester, also have a "logistics hub" (i.e a car park) in Belgium, but if Nice develops the way Brailsford thinks it will, everybody will soon be clamouring to join the party on the Promenade des Anglais. So, you've got a team with great riders, innovative coaches and state-of-the-art kit. This team places great store in preparing properly, works hard on building team spirit and tries to be as transparent as possible. And now they want to build on the last year's breakthrough, challenge on all fronts and become as respected in their field as Barcelona are in theirs. What's not to like? Ah, that will be the perception that all cyclists are cheats and that the best cyclists must be the best cheats. It is but even they know mistakes have been made, none worse than the hiring of Belgian doctor Geert Leinders, a man now accused of systematic doping at his former team, Rabobank. Brailsford can rightly claim that hindsight is wonderful and "we would not have touched him if we knew then what we know now", but he must also understand there is a sizeable constituency of sports fans that now have a guilty-until-proven-innocent approach to cycling. It is perfectly reasonable for Kerrison to ask: "How would you feel if your credibility is constantly being challenged just because you're doing well?" But then it is equally reasonable to reply: "Can you blame them?" Whether any cycling team is capable of becoming the "world's most admired sports team" in the immediate aftermath of the Armstrong affair is debatable, but if Team Sky continue to welcome scrutiny, stick to their principles and keep winning, they could go very close.